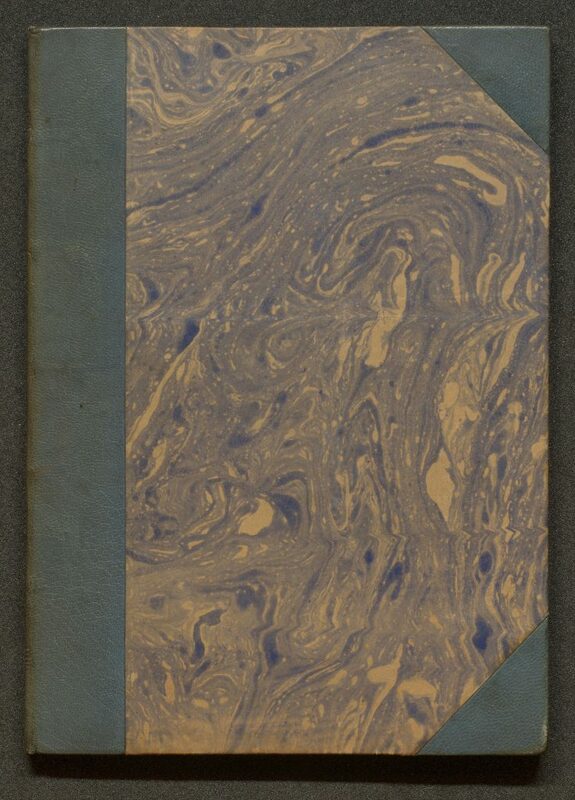 A binding which covers only the spine and the edge of the boards nearest the spine is described as ‘quarter binding.’ The amount of the board covered varies, but the binding may indeed cover one quarter, hence its name. 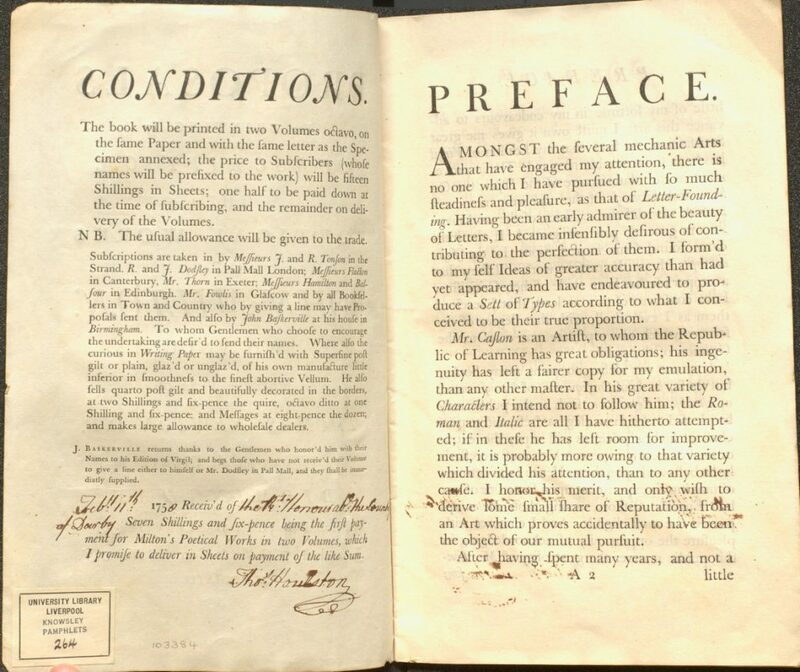 Quarter bindings, which use less material – leather, parchment, cloth, paper, depending on date and style – are cheaper than half bindings which cover the spine and back edge of the boards plus the outer corners of the boards. 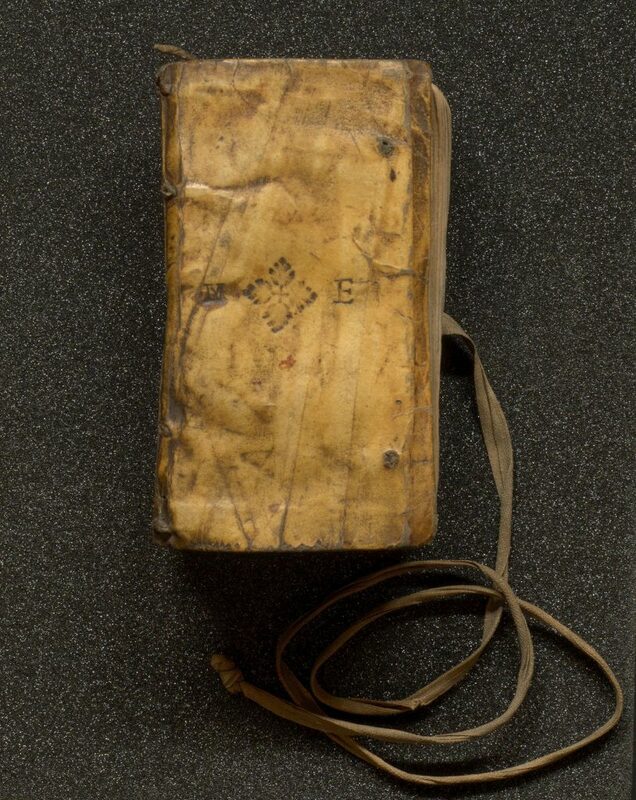 Half and quarter bindings may be described as quarter calf, half parchment, etc, naming the binding material used on the spine. 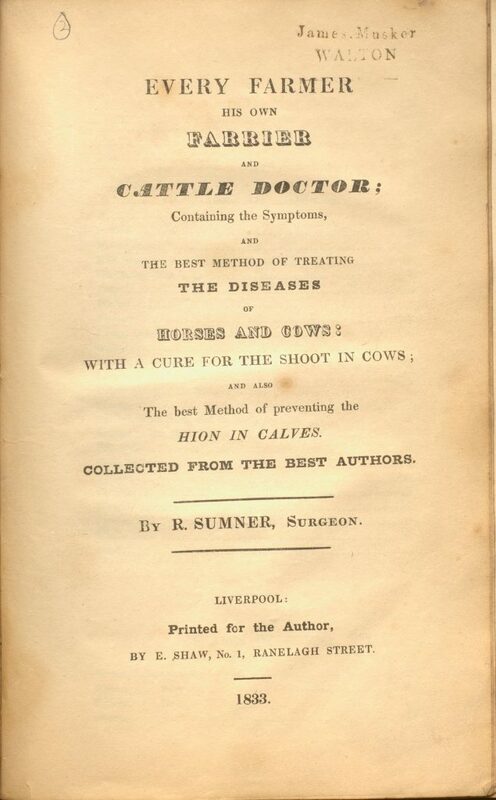 Full calf, for example, describes a binding in which the full extent of the spine and boards is covered in the same material. 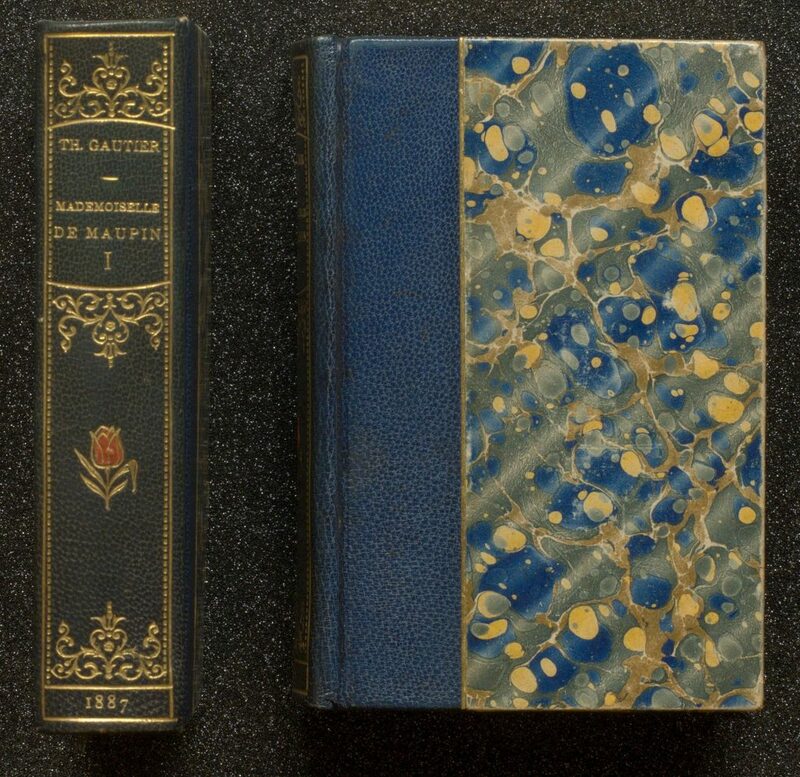 Common styles of binding can help to identify where and when an item was bound, or may be a recognisable ‘uniform’ such as the ‘Roxburghe style’ used for the publications of the Roxburghe Club. Their quarter bindings have a spine of brown or black leather, with the title tooled in gold, and the sides are dark-red paper-board. 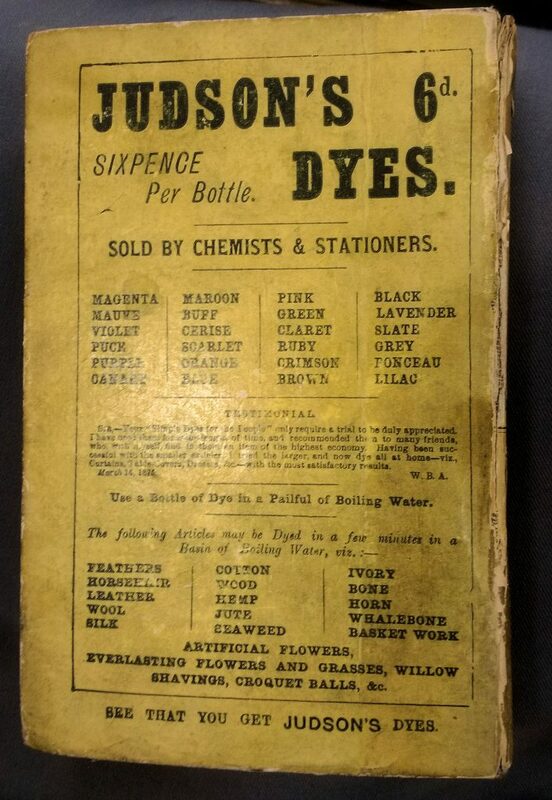 More recently, morocco and buckram have been used in the same colour scheme. 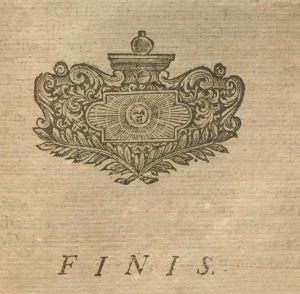 From the 17th century onwards, and notably in the 18th and 19th centuries, as it became usual to shelve books with the spines outward, the spines of quarter- or half-bound books lent themselves to decorative display. 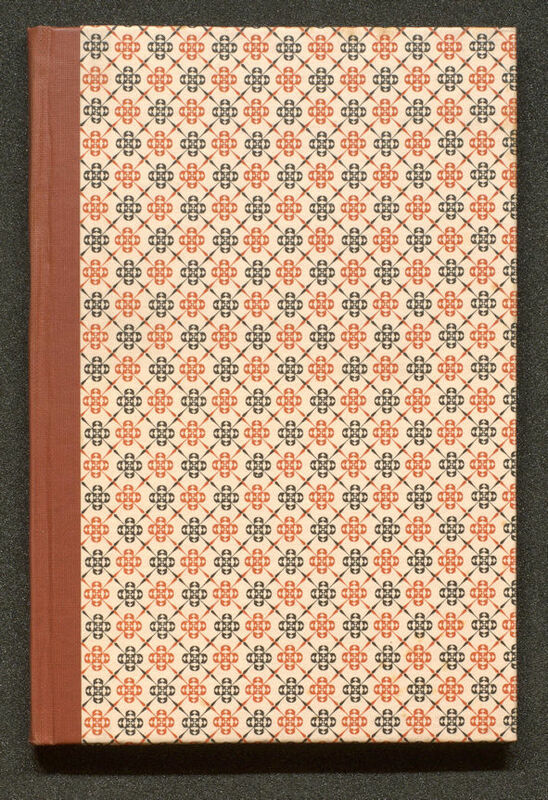 SPEC Zaina C.10: leather spine decorated with gilt-tooling and colour onlay, and marbled paper boards on Paris, 1887 edition of Gautier. 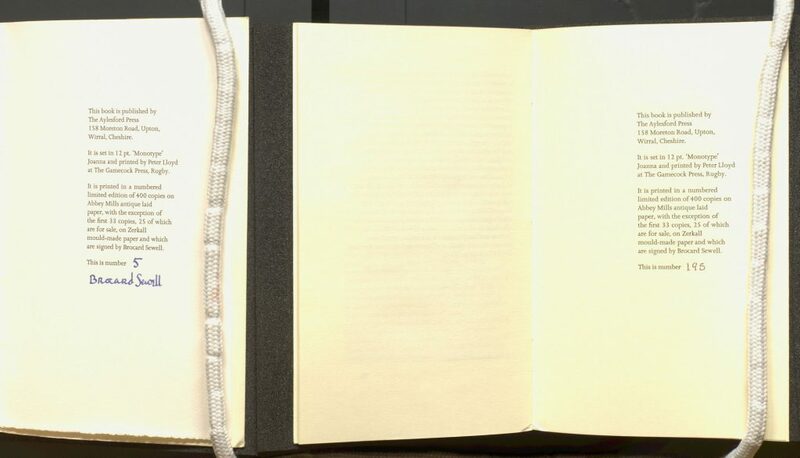 ‘Endleaves’, or ‘endpapers’ are the first blank leaves of paper you come across when opening the book, and the final blank pages at the end. 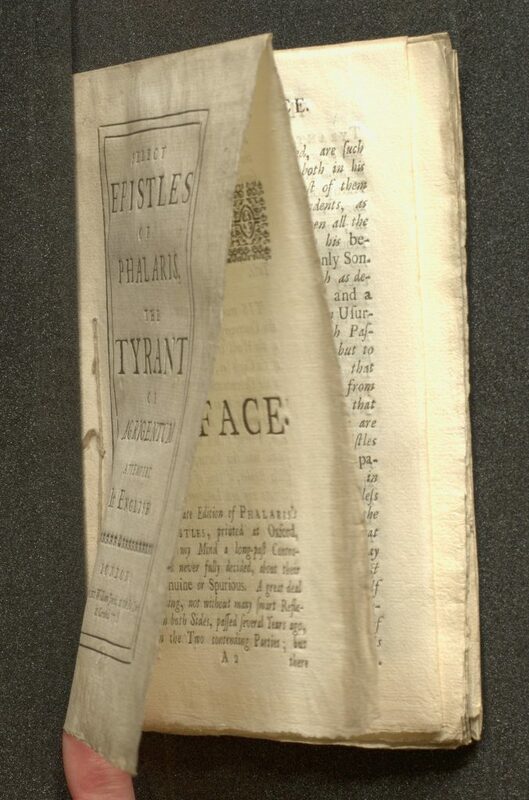 Found between the front or rear of the main textblock and the front and rear covers of the book, then, they are intended to protect the first leaves of text. 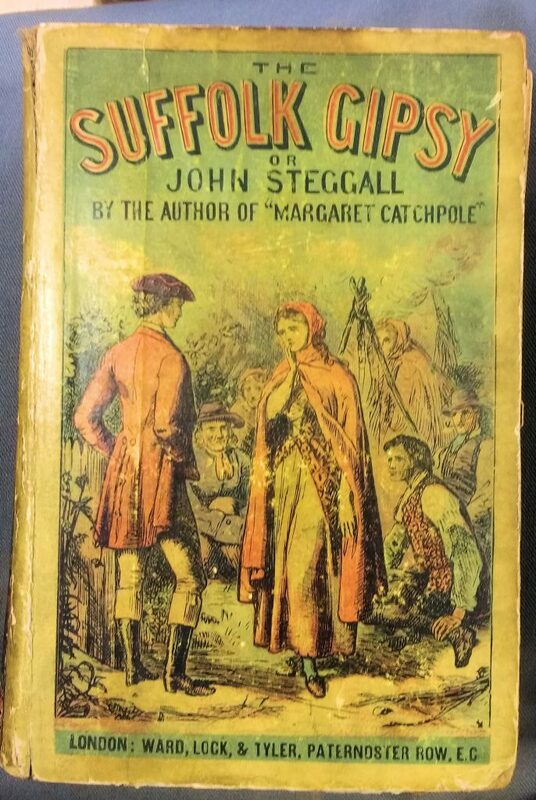 The ‘paste-down’ is the half of the first sheet of endpapers which has been adhered to the inside of the boards or cover of the book (literally, pasted down). Endleaves that are not pasted-down to the cover or boards are usually described as being ‘free’. 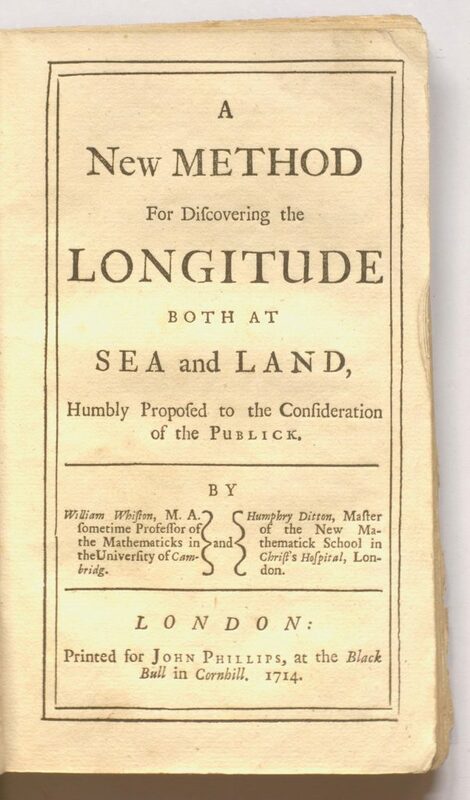 This image shows the rear paste-down, and rear free endpaper. 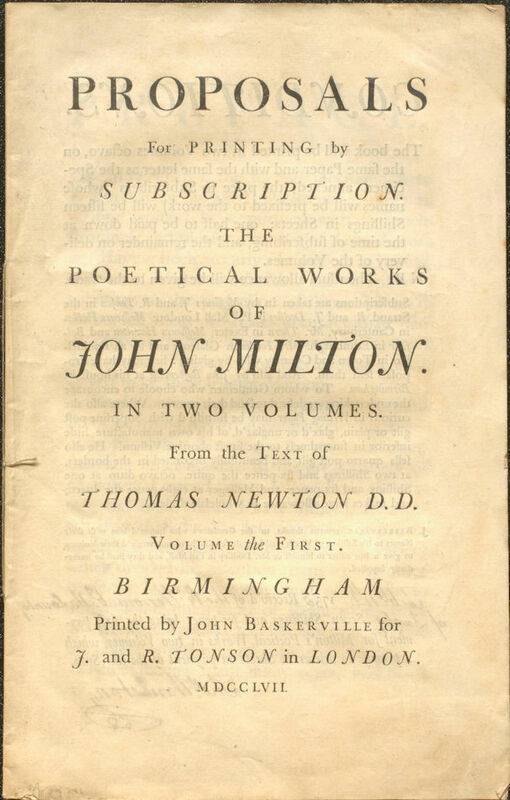 An ownership inscription can be seen on the paste-down, which also contains a booksellers price label, and further markings in pencil. Paste-down is a useful term to know because it appears regularly in catalogue records. 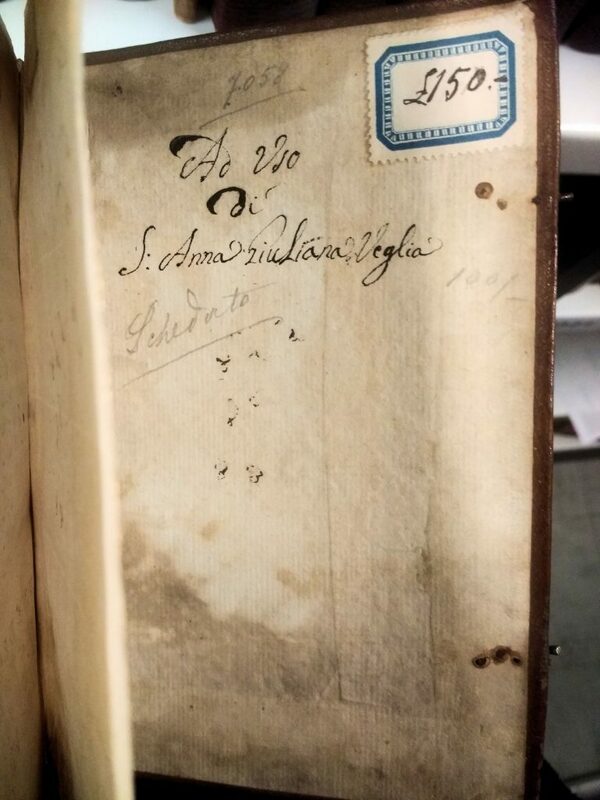 This is primarily because the paste-downs of a book are often where we find a number of interesting features – such as ownership inscriptions, bookplates, bookseller’s labels, previous classmarks – which have been added after publication and help to tell the unique history of that particular book (to use another ‘p’ term, we call this the book’s provenance). 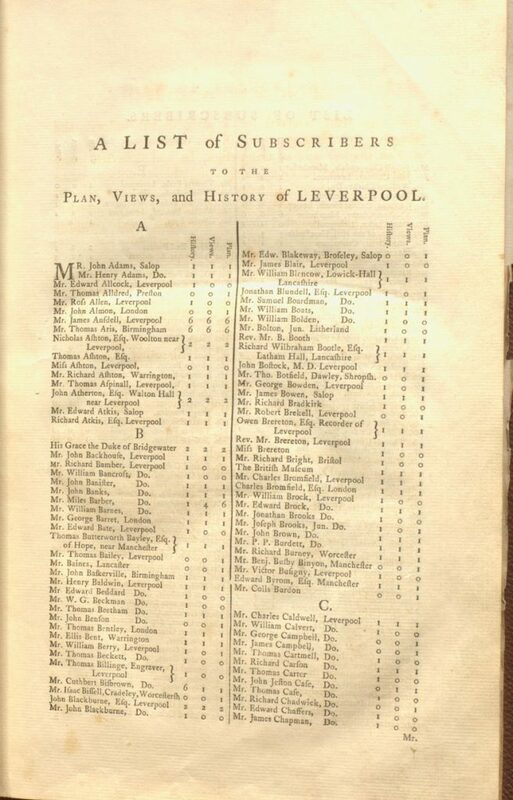 All of the hundreds of bound volumes of pamphlets from the Knowsley Hall Library collection contain precise details of their location within the library on the front paste-down. 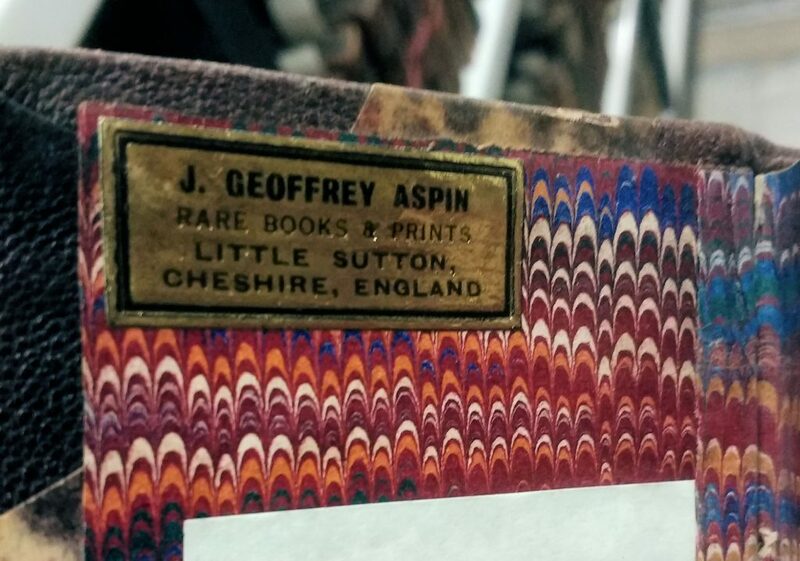 Bookseller’s label on a colourful paste-down. 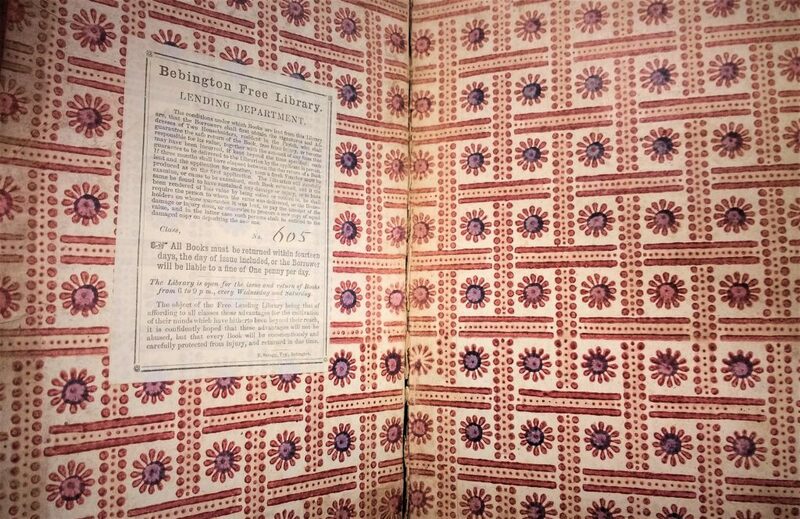 In this image the endpaper is comprised of a colourful patterned endleaf, and contains the bookplate of the Bebington Free Library, reflecting the history of the book. 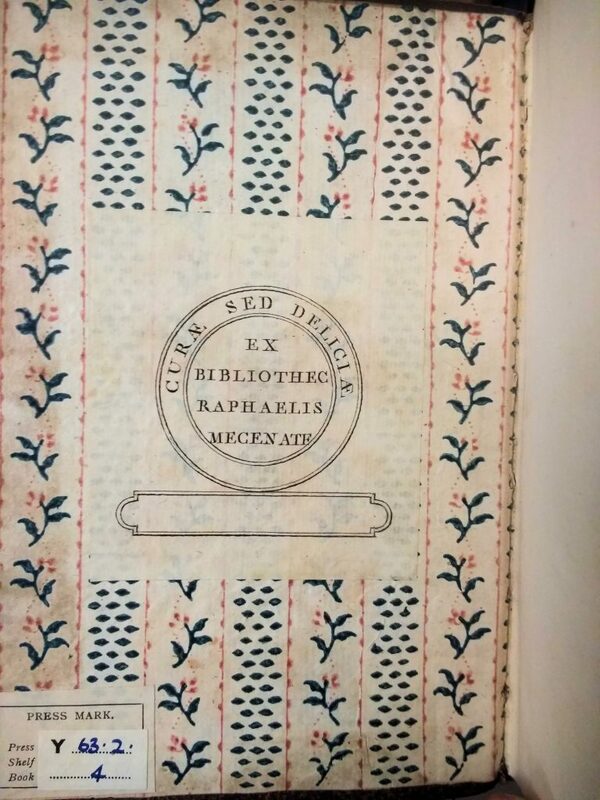 Rear paste-down of the same book, with a second bookplate. 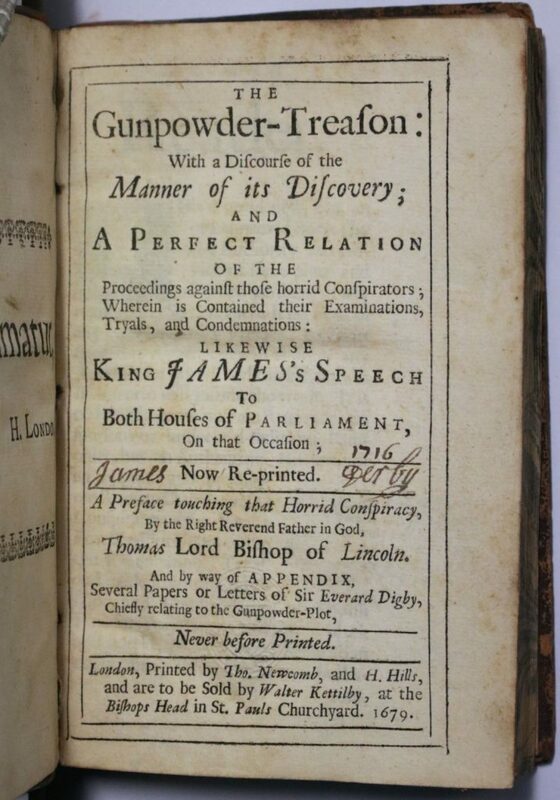 Headpiece on a sermon of 1717: SPEC LGP 425. ESTC T45992. 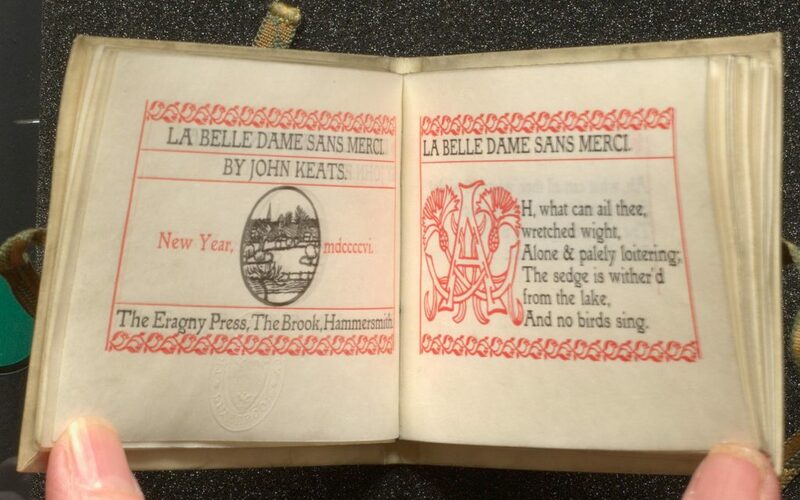 Printer’s ornaments are small decorative woodcuts or metal cuts used in letterpress printing as fillers on title-pages, and to demarcate the beginning and end of chapters or other sections. Factotum containing initial T. SPEC LGP 425. 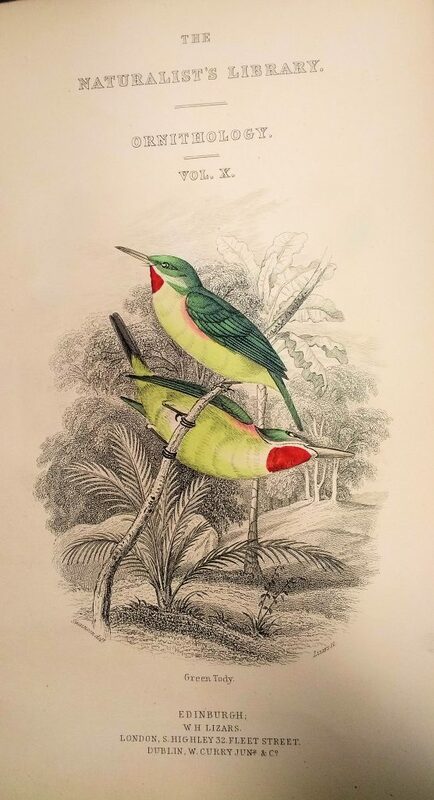 They may be described as head-pieces (at the head or top of the page) or tail-pieces (at the end or foot of the page); larger images may be described as vignettes. 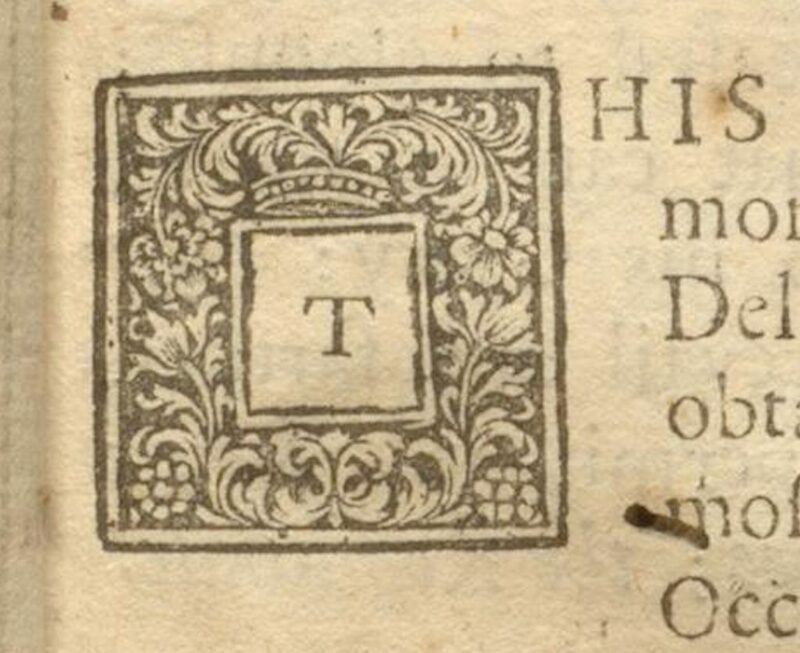 Ornaments include the large initials used to mark the opening section of text, and factotums, which form a decorative border into which any letter can be inserted in printing. Fleurons are flowers or other small pieces of ornamental typography. 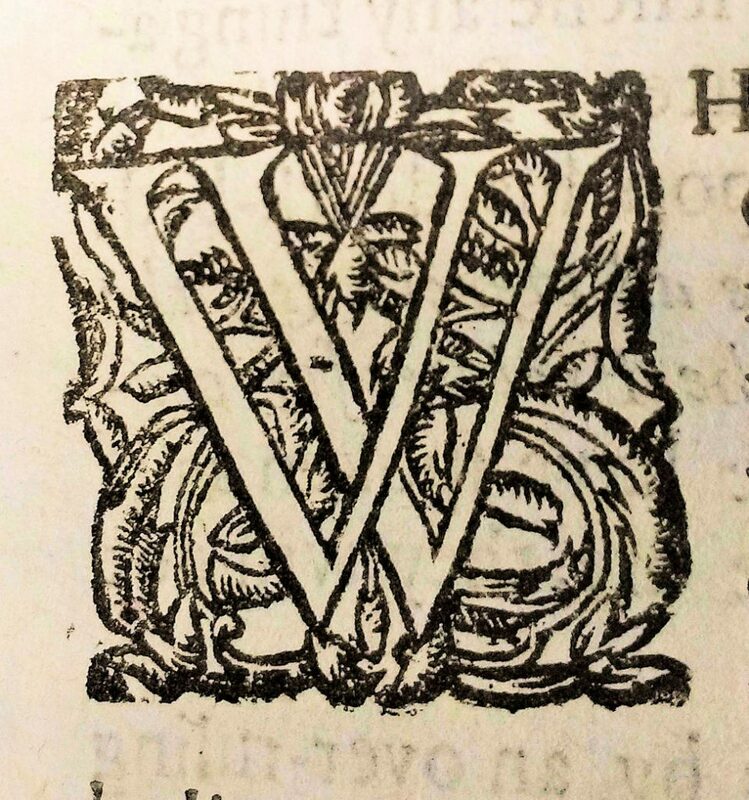 Fleurons on the half-title of SPEC LGP 425. 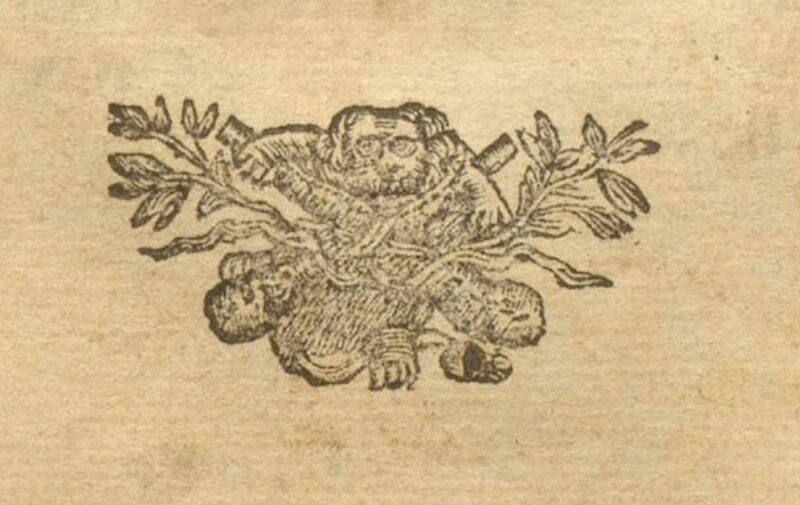 Woodcut ornaments in particular show the wear and tear of repeated use, and can be used in dating and localizing publications, although in practice type may have been loaned or sold between printers. A change of ornament can also be used to identify a variant printing. 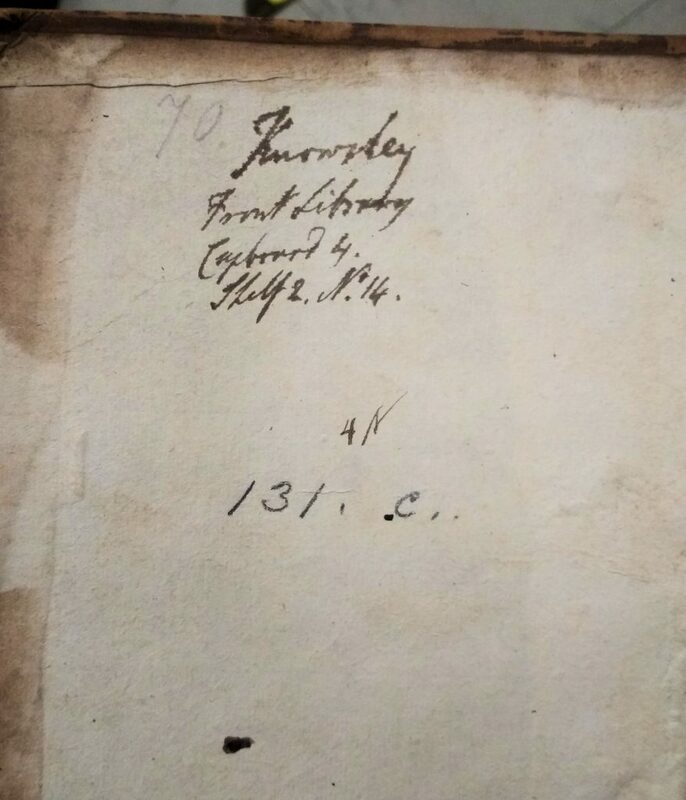 In rare cases where the ledgers of a printing business survive, such as those for the firm of William Bowyer, ornaments provide rich supplementary evidence to identify anonymous printing by comparison with known imprints. 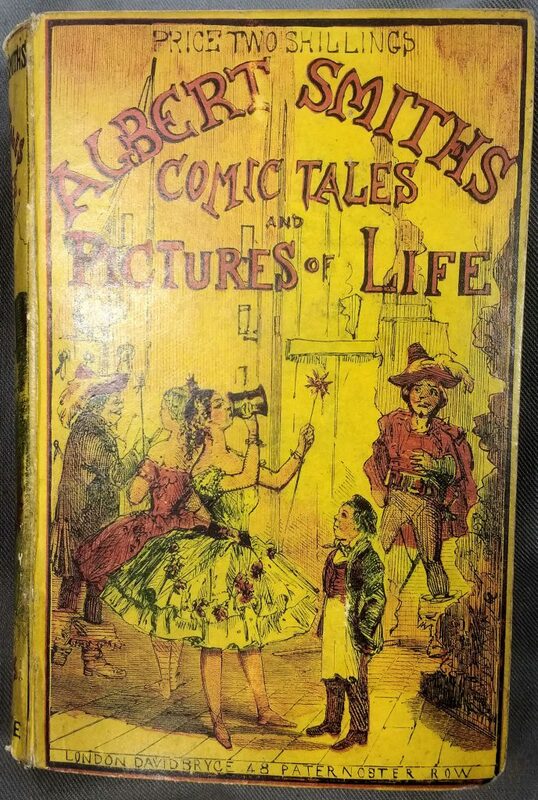 Although ornaments are generally decorative and are not used to illustrate a specific accompanying text, they may be pictorial in themselves, and are a charmingly various source for design history. Tailpiece on SPEC LGP 425. 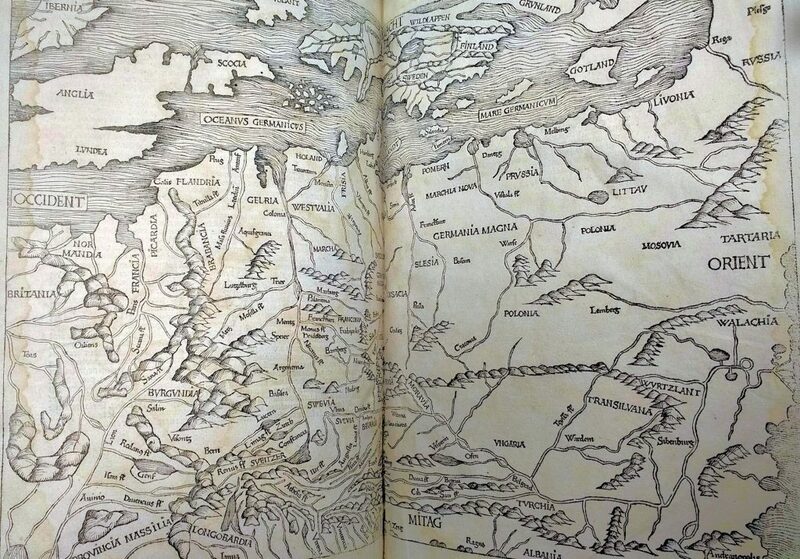 The Nuremberg Chronicle (Liber Chronicarum in Latin or Das Buch der Croniken und Geschichten in German) is one of the most important books in the history of printing. 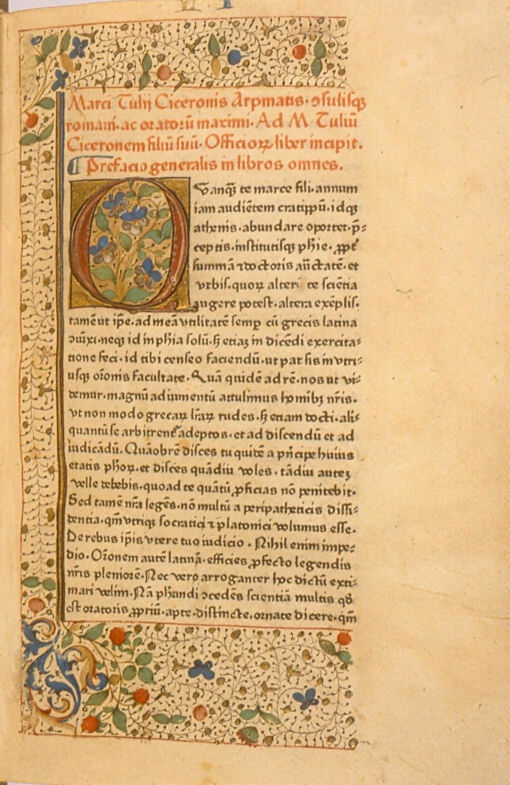 Produced on commission from Nuremberg merchants Sebald Schreyer (1446-1520) and Sebastian Kammermeister (1446-1503) in 1493, the 600 page text is attributed to Nuremberg doctor and humanist Hartmann Schedel (1440-1514). Drawing heavily from earlier, medieval and Renaissance sources, Schedel purports to tell the history of the Christian world from its creation to the time of writing. 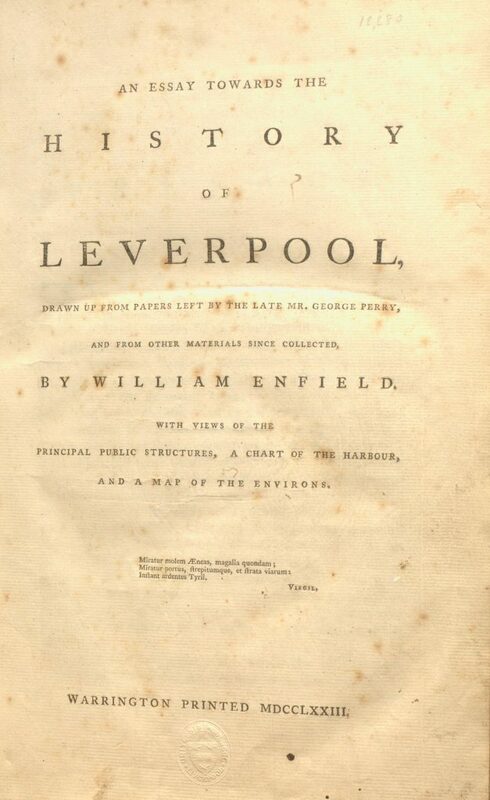 The text incorporates its fair share of myth and fable – with geographical and historical information on European counties and towns written alongside tales of epidemics, monsters and comets. What makes this work remarkable however, is not so much the text itself, but rather the beauty and skill of the images that accompany it – bringing to life the biblical and historical events, major cities and important figures from myth and history within the text. Indeed, the Nuremberg Chronicle is the most lavishly illustrated book of the 15th century. In total, the work boasts 1809 images, produced using 645 woodblocks, many of which were used more than once. A mere 72 blocks were used for the 596 portraits of emperors, popes and other celebrities, for example – so each was used to represent 8 or 9 different people, changing only the caption. 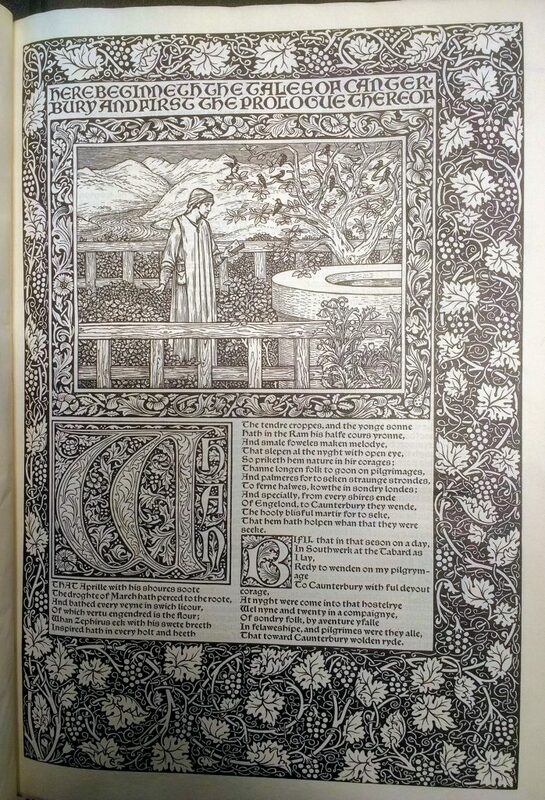 As you can see from the above image, the woodcut images were incorporated closely within the letterpress text. 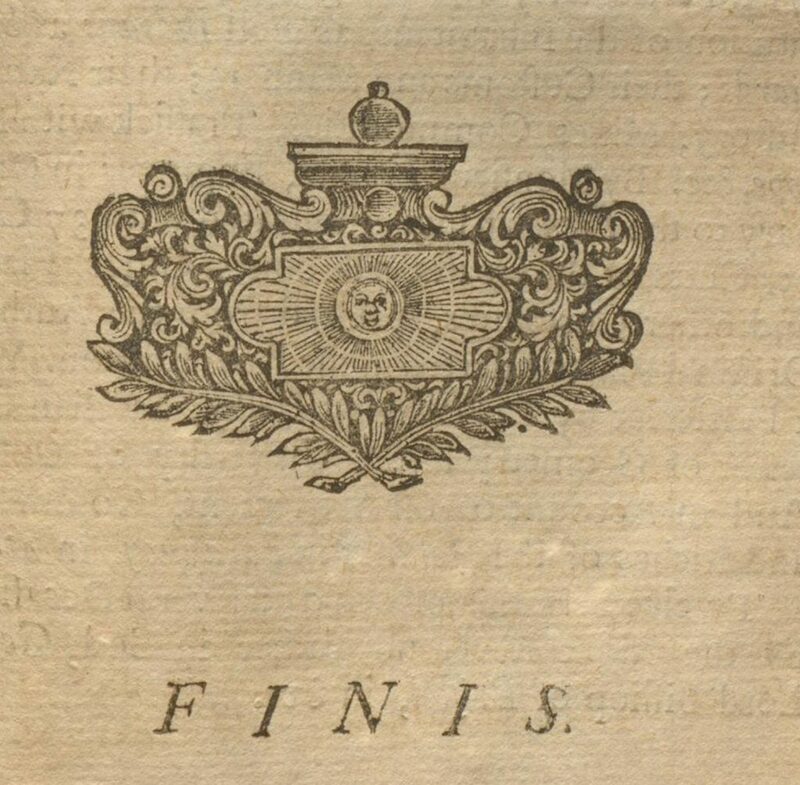 A feat of considerable technical skill on the part of those involved in its production, this resulted in a particularly elegant and satisfying mise-en-page. 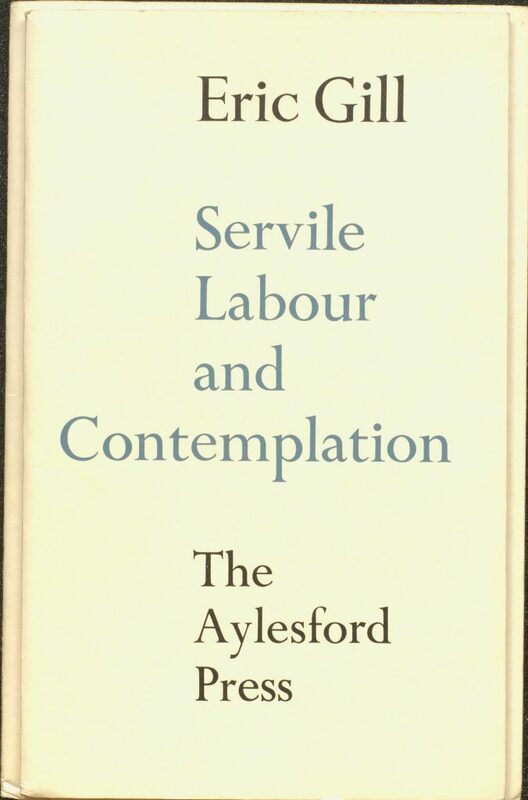 To enable this, the work was first carefully planned in manuscript drafts (called ‘exemplars’) before printing. 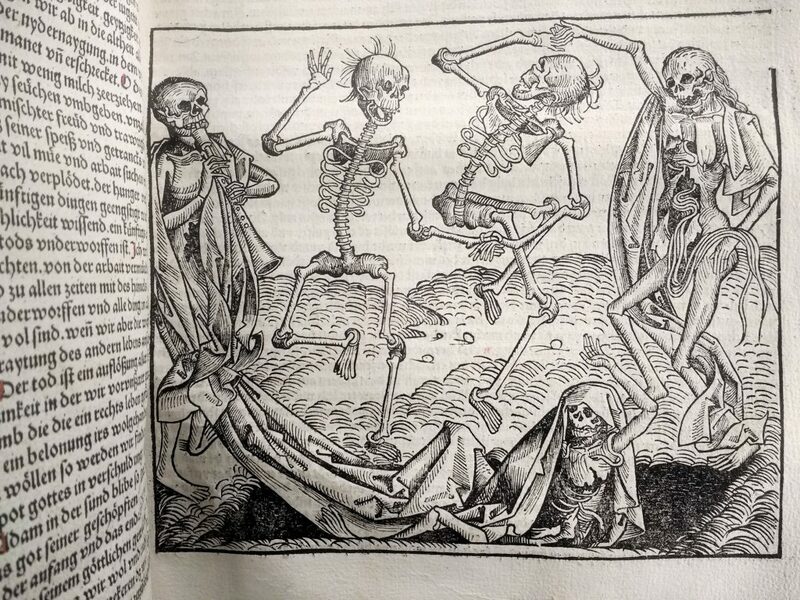 Remarkably, complete exemplars of both the Latin and the German edition of the Nuremberg Chronicle survive, and indicate that the images were sketched first, with the text inscribed to fit within the remaining space. 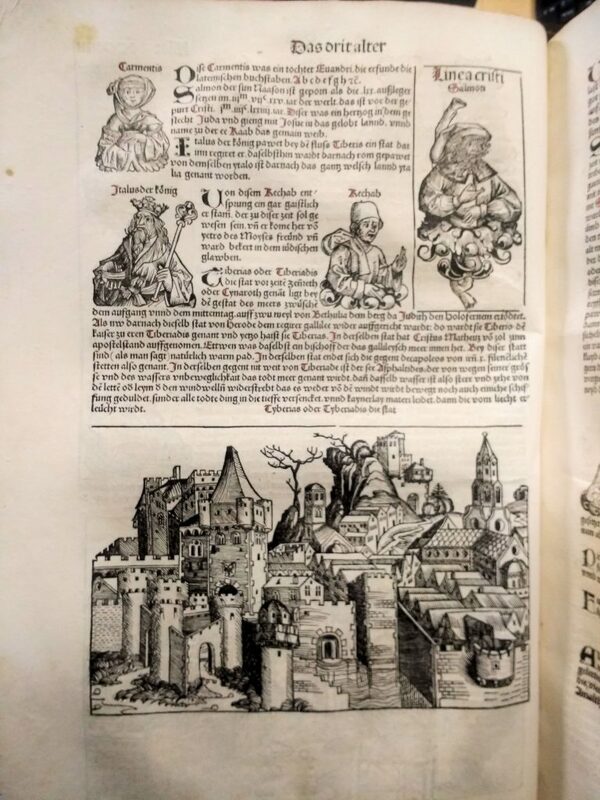 The woodcuts and exemplars for the Nuremberg Chronicle were produced by Michael Wohlgemut (1434-1519) and his stepson Wilhelm Pleydenwurff (c.1460-1494), and the work was printed and published by Anton Koberger (1445-1513) – the largest printer and publisher in Germany at the time. 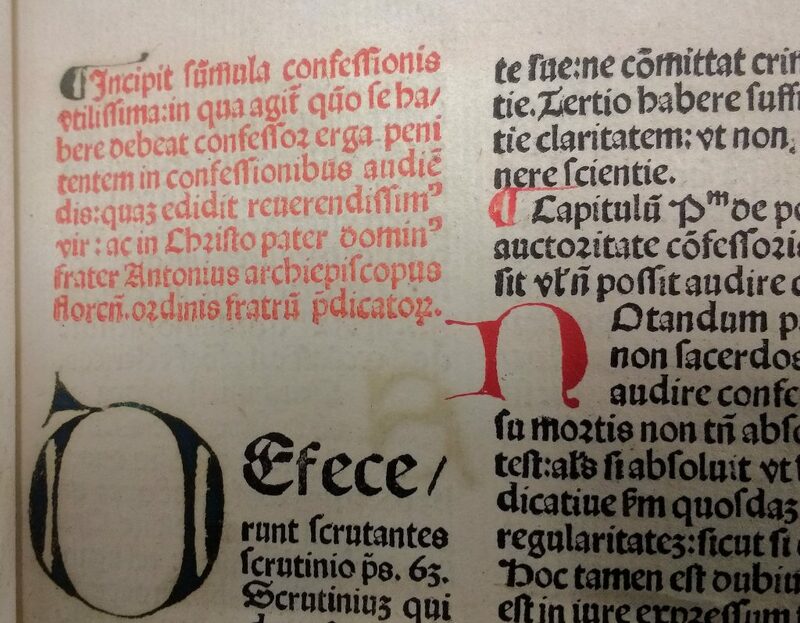 Koberger printed the Latin version on the 12th July 1493, with a German translation following shortly after, on 23rd December 1493. 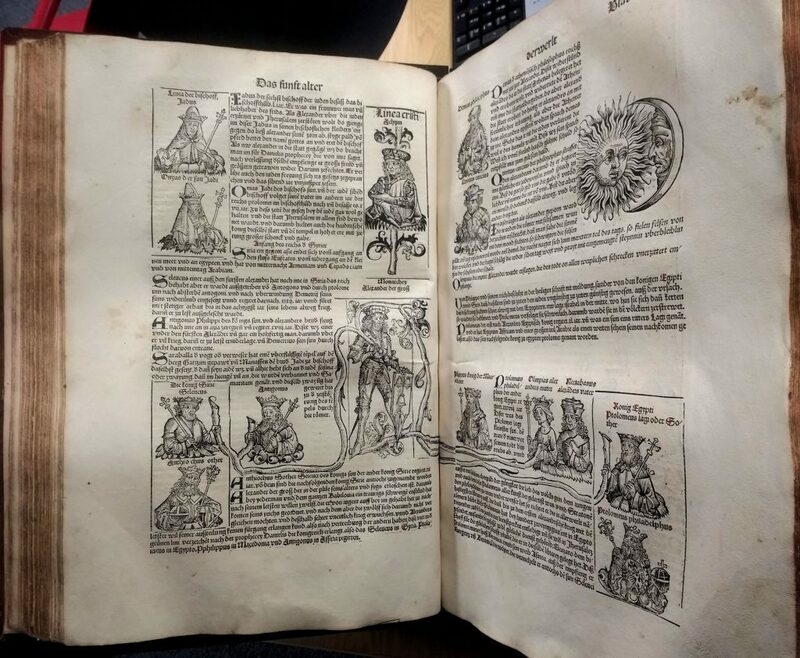 The University of Liverpool Special Collections and Archives (SC&A) is fortunate enough to hold three copies of the 1493 Latin edition, and one of the German translation. A final copy of the Chronicle in SC&A is a pirated edition, printed by Johann Schönsperger (d. 1520) in Augsberg in 1500. 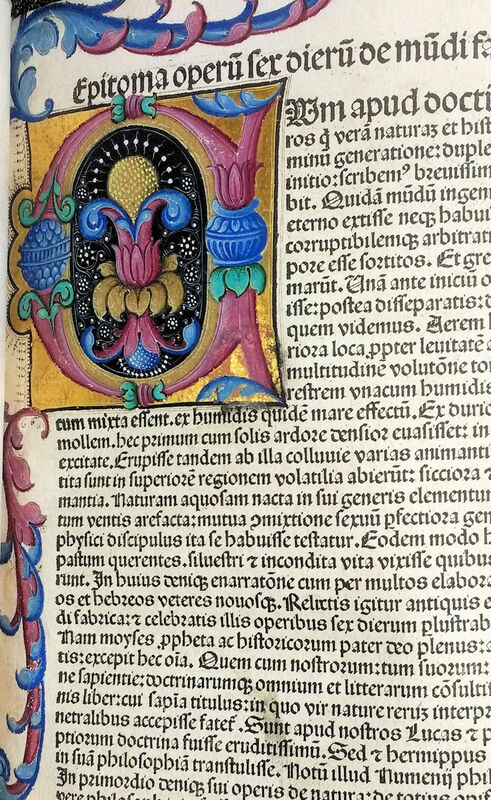 That SC&A holds so many copies of such an early printed book is perhaps rendered a little less surprising when we learn that no other 15th century book survives in as many copies as the Nuremberg Chronicle, undoubtedly an indication of its popularity at the time, as well as its enduring interest to collectors and researchers alike. 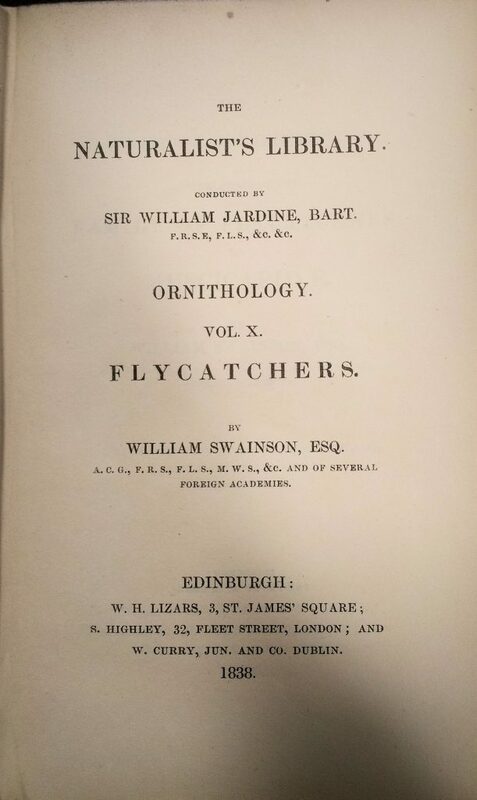 Indeed, the SC&A copies were given to us by some of the most important donors in the history of the library – Charles Sydney Jones, Henry Tate, Thomas Glazebrook Rylands and Robert George Morton, and we were recently very excited to have all five SC&A copies of this important work on display in the reading room at one time, having beeen ordered up by Dr. Nina Adamova, as part of her research into marginalia in copies of the Chronicle. 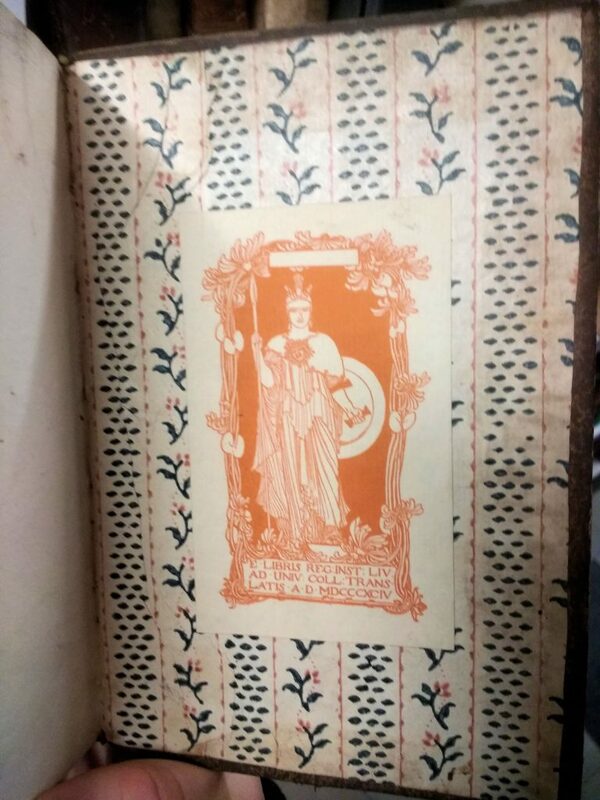 Large flourished initial in gold and colours on folio 1 of the copy of the Chronicle donated to SC&A by Robert George Morton in 1969.